The Rt Hon George Eustice MP, Minister of State for DEFRA, welcomed some 600 international wine producers, marketers and media from 30 different countries to Brighton as he opened the ninth International Cool Climate Wine Symposium at the end of May. This major international event, hosted by a different country every four years, is regarded as the most important academic wine conference in the world, attracting the great and the good of the global wine community. 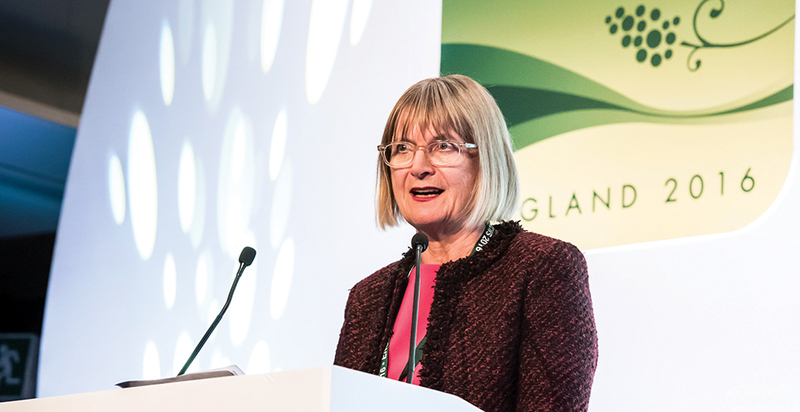 Following immediately after the Minister, leading wine luminary Jancis Robinson MW OBE spoke about the history of the Symposium, noting how far the UK wine industry has come since the idea of hosting the conference was hatched 16 years ago. She also took the opportunity to appeal to DEFRA to reinstate its funding for the vital WineSkills Programme for UK wine producers, run at the UK’s centre of wine education, Plumpton College, and to rejoin the International Organisation of Vine & Wine (OIV). “Plumpton College’s WineSkills Programme has had to be abandoned because DEFRA has rescinded its funding of it – at the very time when the English wine industry has reached new heights of accomplishment and fame,” she commented.